In the wake of the election, Republicans are feeling more optimistic about their party’s future. By contrast, Democrats’ optimism about the Democratic Party’s future has declined. And Democrats are more likely than Republicans to say their party has done too little to address the concerns of a number of groups, including women, minorities and residents of rural areas. Today, 79% of Republicans say they are very or somewhat optimistic about the future of the Republican Party. In early November, on the eve of the election, 61% of Republicans expressed optimism about their party’s future. 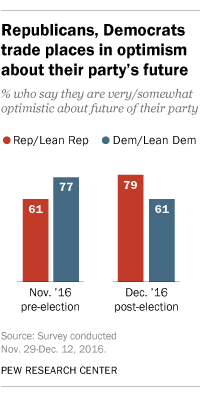 Democrats’ optimism about their party’s future has declined by a comparable margin over the same period – though a majority (61%) continues to be optimistic. Before the election, 77% of Democrats were optimistic about the party’s future, which is almost identical to the share of Republicans who are upbeat about their party’s now. The latest national survey by Pew Research Center, conducted Nov. 29-Dec. 12 among 4,183 adults on Pew Research Center’s nationally representative American Trends Panel also finds that Republicans and Democrats have very different views about their party’s outreach to various groups in society, including women, minorities, people who live in rural areas and those with different levels of educational attainment. A majority of Republicans and Republican leaners say their party does about the right amount (57%) to address the concerns and priorities of women; just 33% say it does too little, while 6% say it does too much. Democrats and Democratic leaners, by contrast, are about as likely to say their party does too little to address women’s concerns (48%) as about the right amount (45%). This pattern also is seen in views of the parties’ efforts in addressing concerns of several other groups: Democrats are more likely than Republicans to say their party does too little to address the concerns of blacks (50% of Democrats vs. 32% of Republicans), Hispanics (43% vs. 29%) and men (26% vs. 16%). 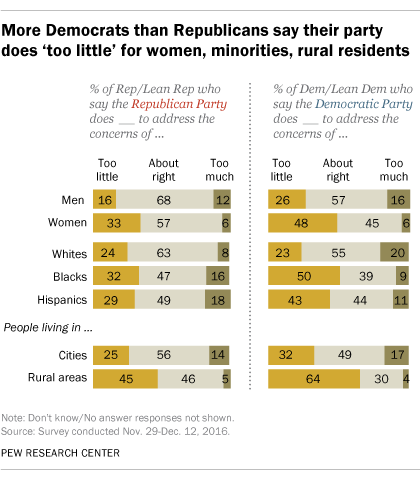 And while 64% of Democrats say their party does too little to address the concerns of people in rural areas, a smaller share of Republicans (45%) say this about the GOP. In fact, of the 16 groups asked about in the survey, Democrats are more likely than Republicans to say their party does too little to address the needs of 11 of these groups; there is no group for which Republicans are more likely than Democrats to say their party does too little. However, Republicans and Democrats do generally agree that their parties do too little for middle- income people (54% of Republicans say this, as do 58% of Democrats) and low-income people (52% of Republicans, 62% of Democrats). And comparable shares in both parties say their parties do too much for high-income people (45% of Republicans, 43% of Democrats). A little over a month after the hard-fought presidential election, a substantial majority of Democrats (90%) still say they feel disappointed (64%) or angry (26%) about Trump’s win. Yet when asked earlier in the campaign how they would feel if Trump won, more Democrats expected they would be angry. In early November, 39% said they would be angry if Trump won. Republicans’ reactions to Trump’s victory also are somewhat different from the reactions they expected to have prior to the election. Today, 38% of Republicans say they are excited and 48% are relieved that Trump won, while 13% say they are disappointed. 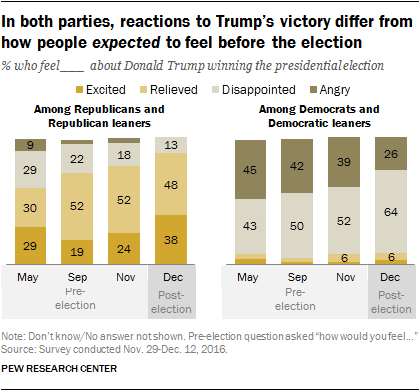 In pre-election surveys, fewer Republicans anticipated they would feel excited about a Trump victory, while greater shares expected they would feel disappointed. With Trump set to take the oath of office in a month, about three-quarters of the public (76%) thinks that the new president should work closely with the opposing party in Congress, a view shared by 62% of Republicans and 88% of Democrats. But far smaller shares of the public expect that Trump and Democrats will work together: Half of Americans say it is at least somewhat likely Trump will work with Democrats in Washington to address important issues facing the country, while roughly as many (47%) expect Democrats in Washington will work with Trump. 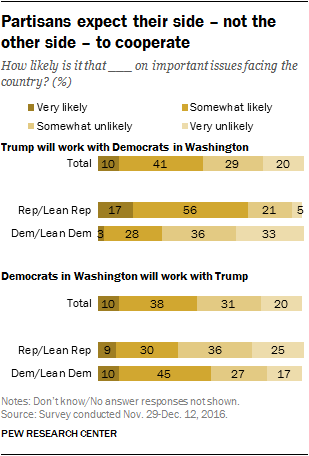 Democrats, in particular, are skeptical that Trump will cooperate with their party: Just 31% of Democrats (compared with 73% of Republicans) say Trump is likely to work with Democrats in Washington. As other recent Pew Research Center surveys have found, Trump’s image has improved since his election victory, though it remains negative on balance. Asked to rate Trump on a 0-100 “thermometer,” 36% give Trump a very or somewhat “warm” rating (51-100), while 14% give him a neutral rating (50) and nearly half (48%) rate him “coldly” (0-49). In two prior surveys, in October and April, majorities had rated Trump coldly. 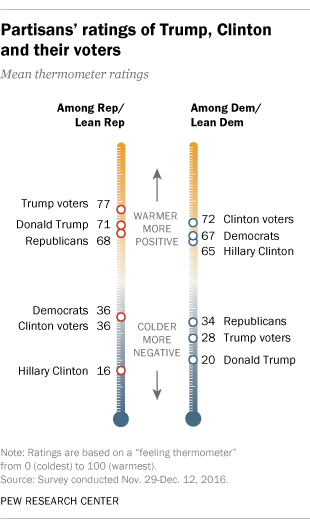 Trump’s post-election thermometer ratings are not significantly different from Hillary Clinton’s: 36% rate Clinton warmly, 14% give her a neutral rating and 48% a cold rating. The survey finds that Republicans and Democrats generally agree that Trump has changed the Republican Party – though they differ sharply over whether this change is positive or negative. Fully 72% of the public, including majorities of Republicans and Democrats say Trump’s campaign and election have led to major (44%) or minor (27%) changes in what the GOP stands for. Among Republicans who say Trump has changed the party’s principles, 83% say these changes have been good for the party. Nearly three-quarters of Democrats (72%) who say Trump has changed the party say this has been bad for the GOP. 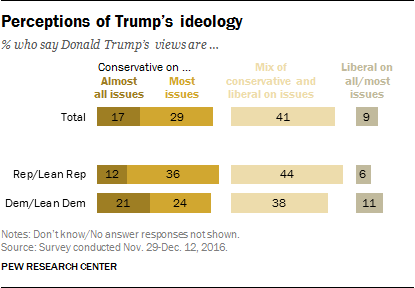 As was the case during the campaign, perceptions of Trump’s ideological views are divided, though only modestly along partisan lines. Overall, 46% characterize Trump’s views as all or mostly conservative, while 41% think of his views as a mix of conservative and liberal (9% say his views are all or mostly liberal). But among Republicans, beliefs about Trump’s views tend to mirror their own: 57% of conservative Republicans and leaners say Trump’s views are all or mostly conservative, while moderate Republicans are more likely to think of him as having a mix of conservative and liberal views (34% say his views are conservative, 52% say they are a mix). Thermometer ratings of the candidates and their supporters. Republicans give Trump supporters more positive thermometer ratings (an average rating of 77) than either Trump himself (71) or Republicans (68). Similarly, Democrats give Clinton supporters a higher average rating (72) than they give to Democrats (65) or Clinton (64). Republicans view Mike Pence ‘warmly,’ have mixed views of Paul Ryan. About six-in-ten Republicans and Republican leaners (61%) rate the vice president-elect “warmly,” while just 8% give him “cold” thermometer ratings; 14% give him neutral ratings. Republicans’ ratings of Paul Ryan are less positive: 38% rate him warmly, 18% give Ryan a cold rating, while 22% give him a neutral rating. Very few regret how they voted. The vast majority of voters say that, if given a “do-over,” they would not change the way they voted. Fully 99% of Trump supporters say, if given the opportunity to vote again, they would stay with Trump; 96% of Clinton supporters say the same. Most non-voters also have no regrets. Among citizens who say they did not cast a ballot in the presidential election, 55% say they do not wish they had voted. Some of the top reasons given for not voting are that they did not like the candidates (26% selected this as a reason they did not vote), they felt their vote would not matter (25%), or they were not registered or eligible to vote (22%).